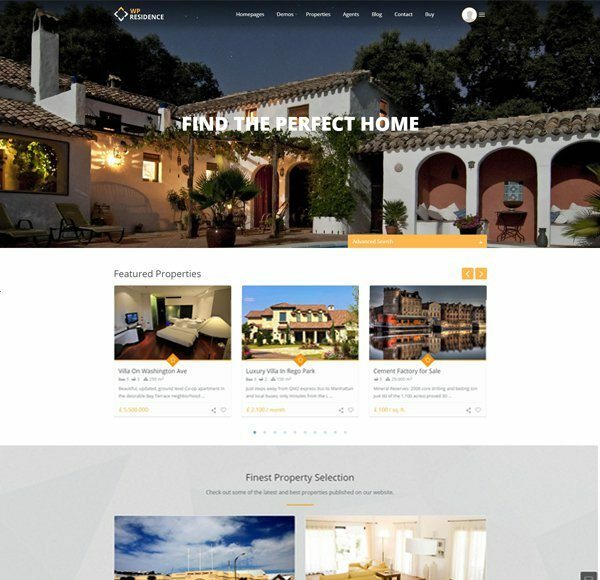 Real estate website templates provide the framework for constructing your website, helping to create the perfect brand and user experience. 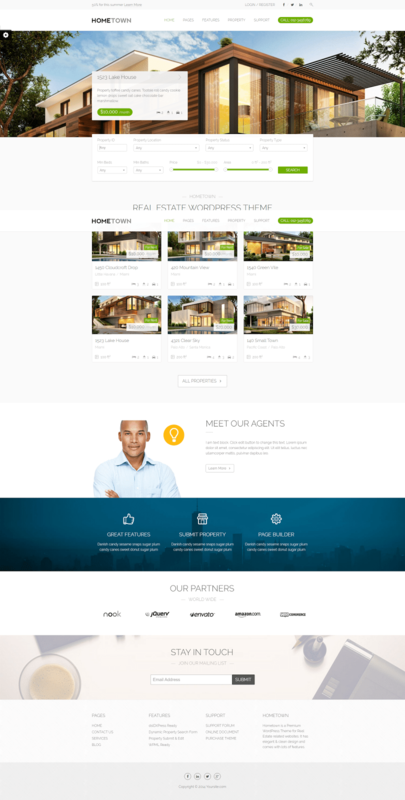 We found the best 25 real estate website templates offered for WordPress today. All of our selected templates are fast, mobile-friendly, allow IDX integration, and can generate seller leads for a price of around $60. 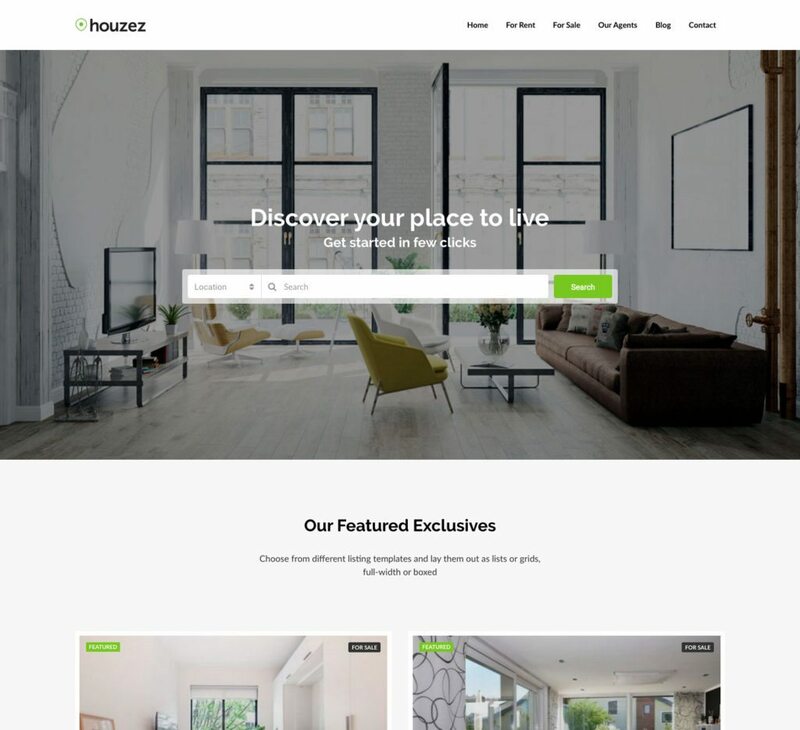 Houzez is one of the most versatile and powerful real estate website templates available for WordPress today. It boasts professional and gorgeous layouts that accommodate a myriad of styles. For example, the customization options allow you to theme it in a modern style with maps, to the more traditional. The price is $59 for unlimited use. Integrations with Houzez include all popular IDX plug-ins such as dsIDXpress, IDX broker, and IHomefinder. You also have the ability to embed videos and Matterport tours among other features, all within a responsive design that is displayed beautifully on any device. 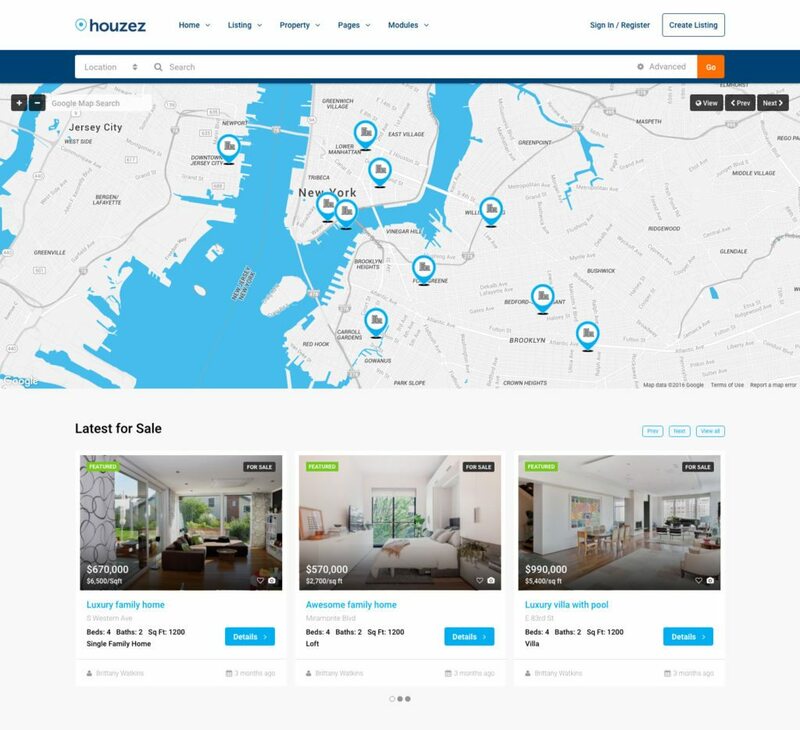 Houzez offers a true turnkey real estate website that includes enough customization options to make it your own for a price that won’t break the bank. At the time of this review, Houzez had a 4.83 average review out of 693 ratings on Themeforest. Real Homes offers a clean and attractive layout with features that can amplify any brand. While it does not offer as many customization options as Houzez, it does offer a responsive design and IDX integration as well as some additional features. The price is $59 for unlimited use. Some unique features Real Homes provides are a mortgage calculator widget as well as giving users the ability to compare selected properties, save favorites, and login with social media accounts like Facebook, Google+, or Twitter. At the time of this article, Real Homes had a 4.67 rating out of 1,037 reviews on Themeforest. Realtyspace offers some wonderful features within an aesthetically pleasing platform. There were useful elements that any agent would love, such as social login, a custom built FAQ, customizable search field, and testimonials module. However, this theme also includes very practical elements that could help those searching for home. For example, including Google Maps with a property street view and satellite view is a wonderful touch for those who want a better look at properties and locations. At the time of this article review, Realtyspace had solid reviews and user experiences, gathering a 4.94 average review out of 177 reviews. With a responsive design and IDX integration, it had a comparable price point with other themes we reviewed at $59 with unlimited use. I suggest using Bluehost for your website hosting needs. With a $2.95 per month hosting fee, unlimited bandwidth, 50GB of bandwidth and 24/7 chat and phone customer support, Bluehost can help get you up and running with your new WordPress template in no time. To read more about why we’ve rated Bluehost the best hosting services for small businesses, see our full review here. WP Residence offers an incredible amount of customization options, including a slide-out side navigation bar, multiple header options, and customizable advanced search options. There’s even a Google Maps button and different property search results pages, including customizable grid size, picture sizes, and map view results pages. While WP Residence also offers a responsive and IDX-compatible design, along with the $59 price point, the unique customization options allowed it to stand out from the crowd. At the time of this review, WP Residence received user reviews averaging 4.8 stars out of 998 ratings. At $75, HomePro Real Estate Portal is one of the more expensive options we included. For that price, we found it to be a gorgeous template that also adds drag-and-drop functionality to the back-end of the site. With this type of functionality, it gives the owner of the site the ability to add forms, buttons, image carousels, or maps simply by dragging and dropping them into the site. Responsive with IDX capability, HomePro Real Estate Portal received only six reviews on Template Monster, but five of them were five stars. 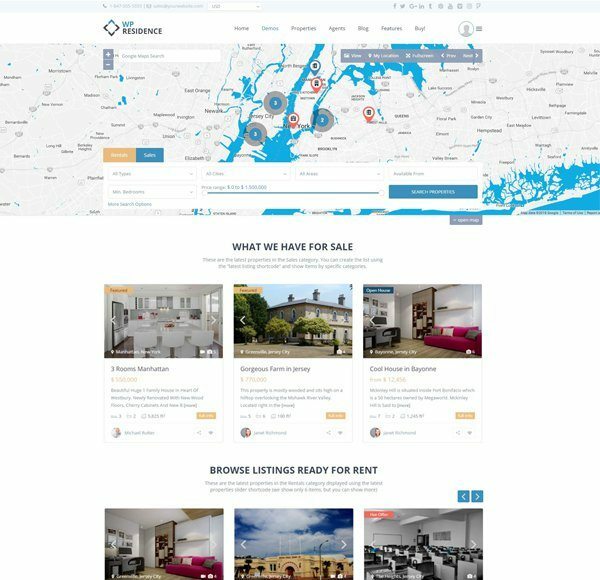 Realocation is a responsive and IDX-compatible WordPress theme that offers a map option that reveals preview photos of different listings on Google Maps. Realocation has a clean design, and advanced search options for users as well. Currently, this theme is $56 and has a 4.16-star average rating out of 69 ratings on Themeforest. Selecting Real Estate 7 is a solid choice, particularly to showcase apartment buildings and rentals while keeping your budget on point. Real Estate 7 is both highly customizable and beautifully designed, including elements like Walkscore (a plug-in that scores an address by how walkable the neighborhood is), sublistings to show individual available units for large apartment buildings, multiple search layout options, and more. Both IDX compatible and responsive, this theme is currently priced at $59, and has a 4.66 average rating out of 441 ratings on Themeforest. Hometown has an almost elegant design that incorporates an incredible amount of features, such as property sliders, search, and mapping capabilities. Uniquely, this theme also integrates with PayPal if you have any types of transactions, and MailChimp for subscriptions. Supporting both IDX integration and mobile responsiveness, this theme grabs a 4.63 average rating out of 111 reviews on Themeforest. CitiLights is a sleek and modern template that has high functionality as well. 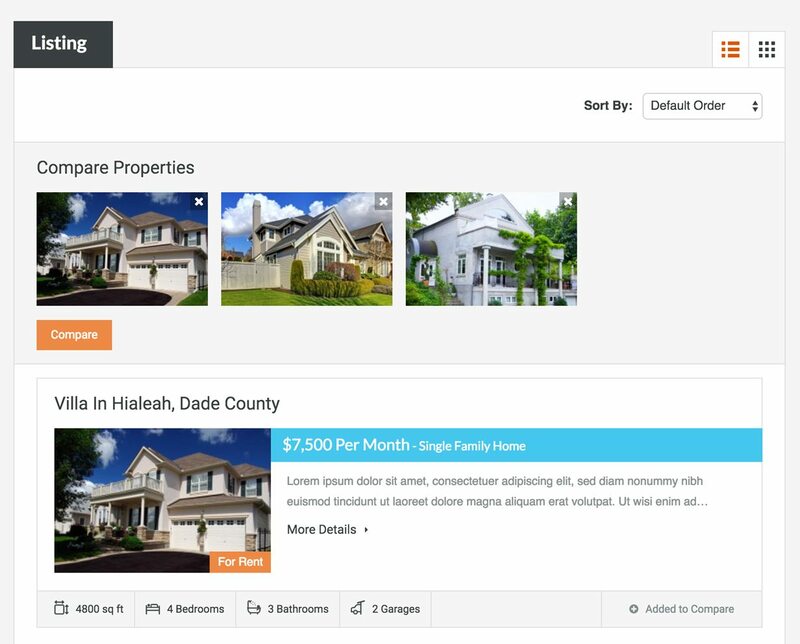 With an easy to use agent dashboard, the ability to mark listings as sold/rented, advanced property search, Google Maps, and easy customization options, this theme is versatile and user friendly. Available IDX integration, mobile friendliness, and a cool membership subscription feature make this $59 theme a solid choice. CitiLights was given an average 4.66 rating out of 109 ratings on Themeforest. We rated dsIDXpress as the most affordable IDX plug-in with the best functionality with good reason. With a price point of $29-$99 per month, and the ability to work with almost every theme on our list, dsIDXpress is not only the most economical option, but one that is one of the most highly compatible with WordPress themes on the market today. See our buyers guide comparing WordPress IDX plug-ins to read more about dsIDXpress. 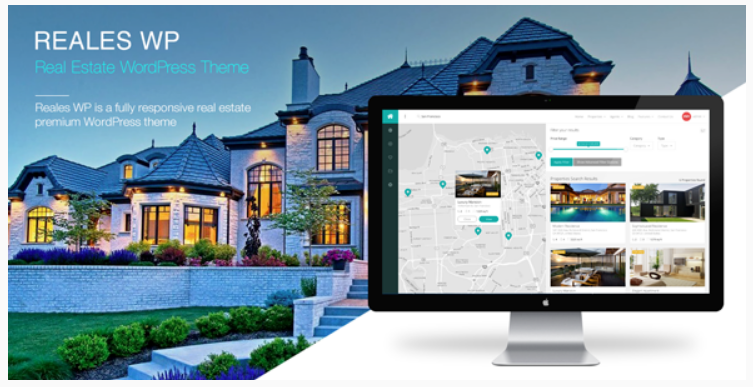 Zoner is a highly customizable and flexible real estate website template that puts your listings front and center. There are more than a dozen layout options, including sliders, maps, featured listings, and a number of other customizable options. One fun inclusion is a sleek rollover animation that shows property details. Zoner is $59, and gets a 4.49 average out of 106 ratings on Themeforest. Realto is a sleek, professional-looking template that includes very subtle rollovers and slider effects. The financing solution is a nice touch, and the theme includes an easy theme options panel, localization support (for translation in bilingual areas), and shortcodes so that you can include buttons, toggles and other features. Realto is $59, and received a 4.09 average rating out of 69 reviews on Themeforest. 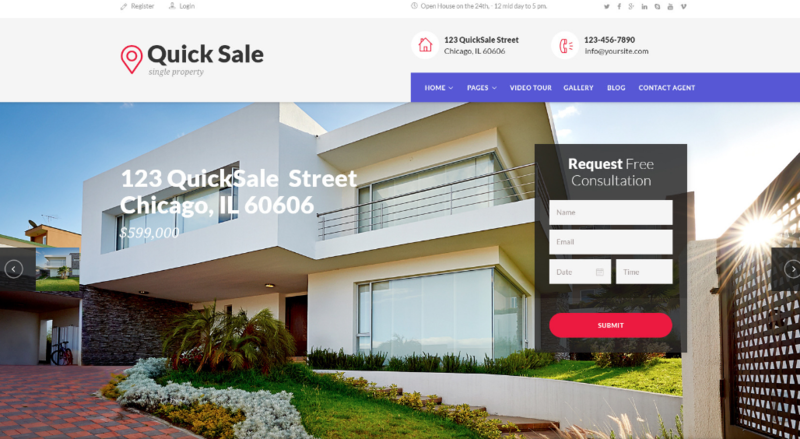 Quick Sale is a single property website template that has a lot of features other single property sites lack, such as a section for testimonials and an agent “about” page. The website displays open houses on the front page, allows easy engagement through lead capture, and provides a beautiful display for images. 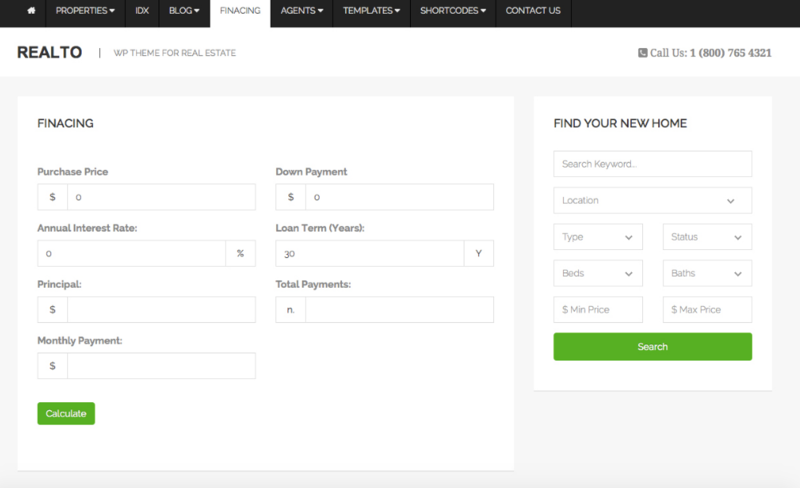 Though it is a single property website, Quick Sale does allow for IDX integration, and is responsive. The price of Quick Sale is $59 with an average 3.8 rating out of 51 reviews on Themeforest. The Realty WordPress template is simple, promotes speed, and eliminates heavy features that slow down load times. Realty made this theme to include the things that are essential, and presents it in a clean and minimalist format. Fonts and icons are simple and work well, and the theme is now offered at a great discount. The owners of this theme have marked it down from $79 to $29 to offer it without ongoing customer support, but do offer a documentation manual. Ratings for this theme are 4.58 out of 312 reviews on Themeforest. 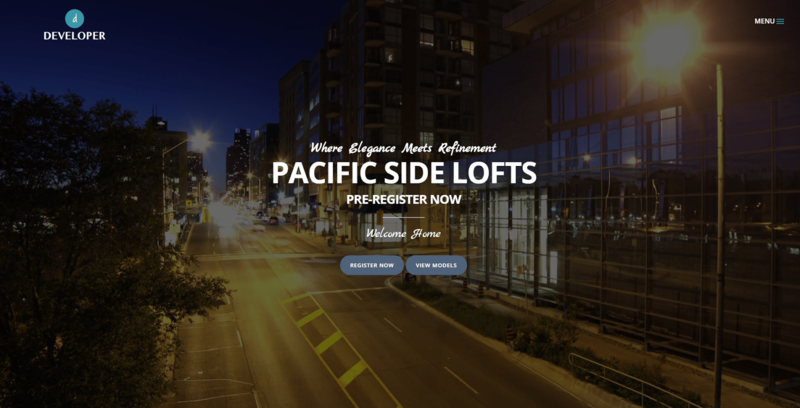 Windsor is a single property website theme designed for new developments. It features sections for availabilities, amenities, contact, a blog, floor plans, and more. WordPress is so easily navigated, a site like this could easily be updated and utilized by property managers and others you employ, and appears refined and professional. This theme is $59, and has a 4.83 average rating out of 36 reviews. Designed for developers, this template features a slick video background and simple yet elegant pages for units. Features include not only a page builder, but Google Maps and markers, unlimited galleries, unlimited forms, points-of-interest section, mini galleries and more. The Developer theme would be well suited for small condo or refurbishment projects, and is priced reasonably at only $44. Out of nine reviews, the Developer theme received an average rating of 4.3. The clean bold design of the Full House template has an easy install and comes with two best-selling WordPress plug-ins (Slider Revolution and Visual Composer), saving you money out of the gate. It features cool sliders for setting a price range for a search, Google Maps Street view integration, and multiple layouts and customization options. The Full House template is priced at $58, and has a 4.6 average rating out of 58 reviews on Themeforest. WP Rentals is a fully functional, short-term rental booking website. You can post multiple properties, and your site visitors can check availability and book rentals right from the website. Some fantastic features include the ability to set custom prices per period, set custom discount prices, adjust for currencies, and manage calendar. The theme supports Stripe and PayPal for online payments, sells for $59, and earns an impressive 4.71 average out of 252 reviews. Reales boasts a modern, clean design with solid functionality. Boasting features like search autocomplete, social media login, front-end property submission and editing for agents, Google Maps integration and more, it’s an easy to use theme that looks sharp across devices. The Reales theme is $54, with an average user rating of 4.52 of 188 reviews on Themeforest. 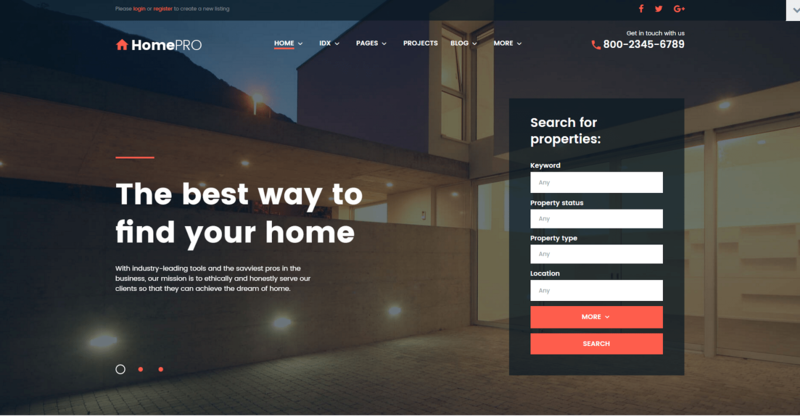 Luster is a WordPress theme that integrates all the expected real estate necessities, but has many elements that give it distinction. While it has IDX integration and search functions, it also is WooCommerce plug-in ready, has PayPal integration and multilingual integration, supports MailChimp and has an array of page templates to choose from when building for a completely customized experience. Luster is $62 and received an average rating of 3.8 out of 50 ratings. Bellaina is a drop-dead gorgeous template built with the Cherry Framework, which adds drag-and-drop functionality to the back of the site. You can add forms, buttons, image carousels, or maps simply by dragging and dropping them into the site. With custom widgets and a range of content modules that even support audio, this theme can be crafted to truly look like a highly custom website. The Bellaina theme is $75, and currently has an average four-star rating out of 21 reviews on TemplateMonster. 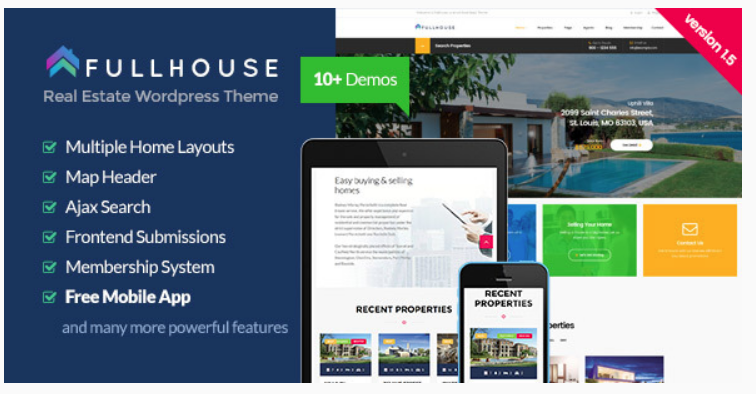 Cozy House is a sleek, minimal template that boasts advanced property search features, Google Maps integration, and the drag-and-drop capability of all templates built on the Cherry Framework. There is a range of modules that you can add to your site, such as a contact form, blog, or carousel images. This theme is $75 and receives an average five-star review out of 12 reviews from TemplateMonster. 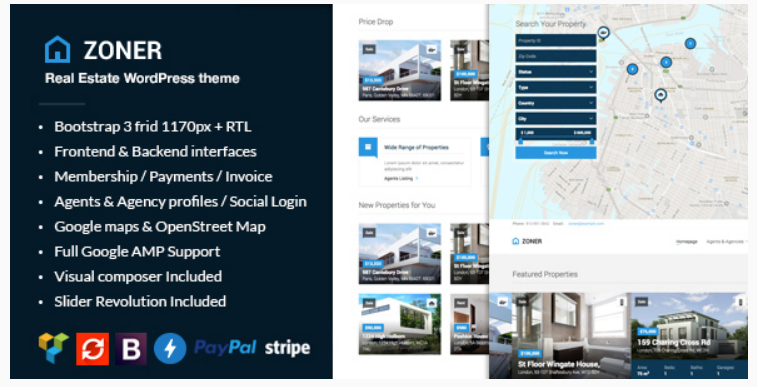 The Real Estate Responsive theme is the most expensive on our list at $199. Built on the Moto CMS platform that provides easy drop-and-drag setup and editing, this template would be ideal for an agent with a small number of exclusive listings due to the stunning layout and variety of features. 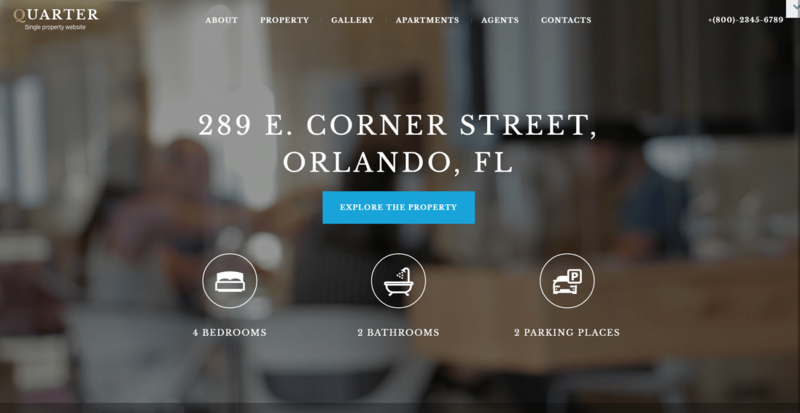 The Real Estate Responsive theme is attentive to load speed while also incorporating things like a grid gallery, video and animation. There are no reviews yet on TemplateMonster for this product. 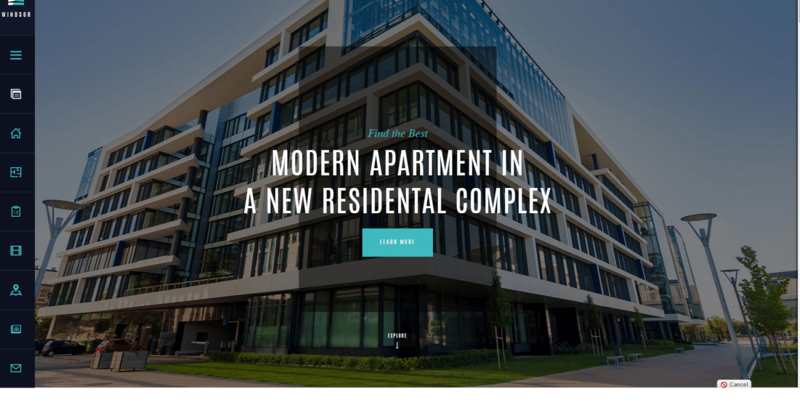 At a price of only $19, this template is designed as a landing page, but would also make a stunning single property site, or even a basic page for a small development or property management company. It comes with a drag-and-drop page builder common to some high-end themes and includes 24/7 free support. 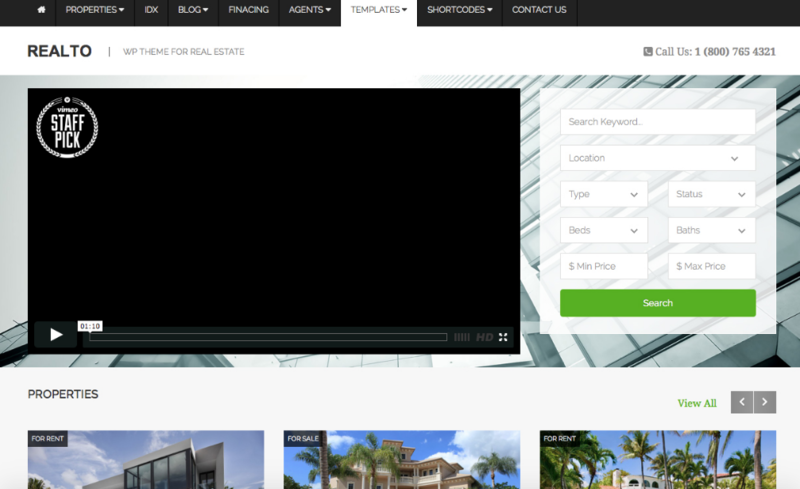 The Real Estate Responsive Landing Page Template had an average 4.8-star rating out of 11 reviews on TemplateMonster. 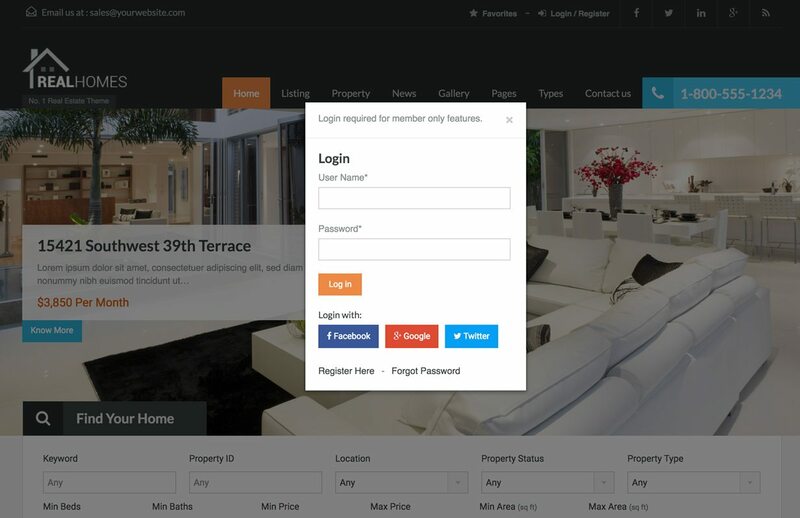 Placester offers a real estate website that is easy to set up and customize, and includes features such as email automation, property searches, and even CRM functionality. If you are not very technically savvy or don’t have the time, Placester is absolutely free to NAR members and simple to navigate. Should you choose to step up to their Agent Pro platform, this upgrade would start at $99 per month with a $99 setup fee. Read more about Placester in our review of the six best real estate lead generation websites for 2018. 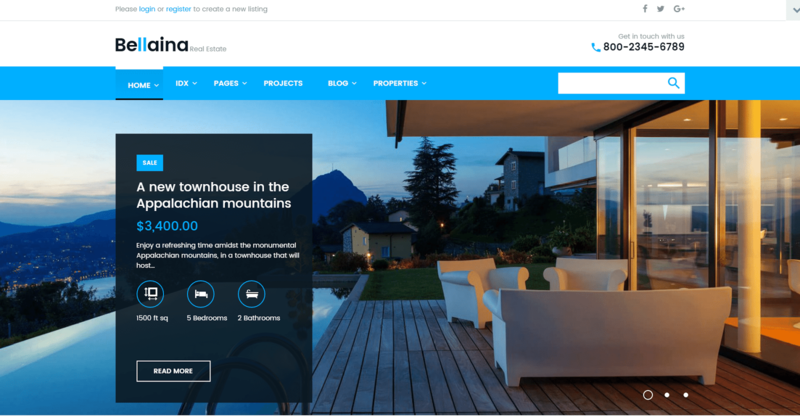 Real estate website templates should be beautiful and functional, offering an array of features that make user experience easy and represent your brand well. There are four elements that should comprise well-functioning real estate templates: responsiveness, fast loading, IDX compatibility, and the ability to generate seller leads. Responsiveness is the ability of real estate website templates to look good and function seamlessly on mobile devices. According to a 2017 NAR study, 72 percent of homebuyers used a mobile phone or tablet in their home search. Having a real estate website template that functions well across mobile devices is essential. If your website is slow, you’re losing leads. According to Kissmetrics, 40 percent of your page visitors will leave if your page doesn’t load within three seconds. While most real estate website templates are designed to load quickly, you want to be sure to not use too many plug-ins or large images that can affect load speed. IDX, or the Internet Data Exchange, is how realtors add MLS searchability to their website. Any real estate website templates you select should have the ability to integrate an IDX plug-in that allows this functionality. Most homebuyers will start their search online before consulting an agent, so IDX compatibility is paramount to capture these unrepresented leads. Two primary ways that real estate website templates generate seller leads are through Home Valuation Landing pages and Lead Capture forms. Home Valuation landing pages offer a CMA (comparative market analysis) in exchange for contact information, while other types of lead capture forms can ask for contact information prior to things like home searches. 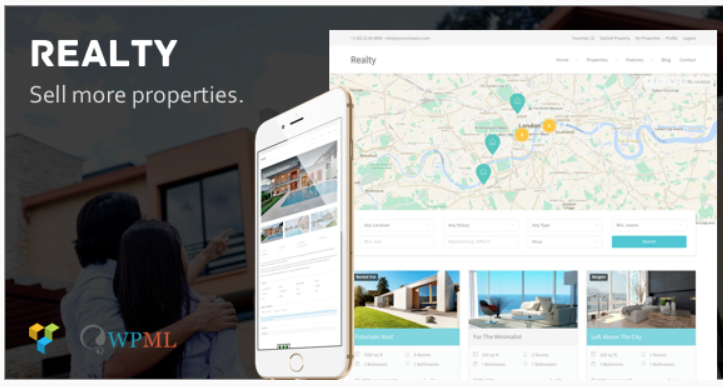 The best real estate website templates combine both functionality and beauty, allowing you to put your best foot forward when presenting your brand to the outside world. Evaluating real estate templates for your own needs can initially seem like a daunting task, but we hope to have given you the options and criteria to get what you need. Ignore the beautiful photos on the templates, and look to see what each can do for you. Thanks! Happy we could help!